I designed this quilt for the Life’s a quilt Facebook Group. It will finish at a size of 48″ x 64″ I had a Fat quarter bundle that has been laying around for a few years so I decided it was time to use it. This quilt is fat quarter friendly. 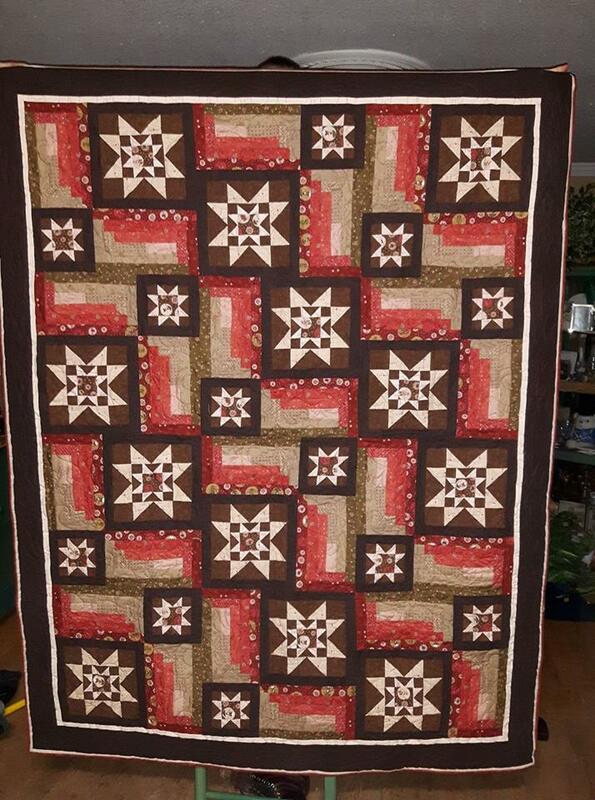 I designed this quilt on my EQ7 quilt design program.. The instructions for “Stellar Cabins” quilt are real easy to follow and feel free to ask any questions that you may have regarding this project. I choose log cabins since Christmas is a time to spend inside with friends and family to me a cabin is a place of warmth and homecoming and of course Christmas would not be without stars.. that led the way for the wise men and shepherds to the manger where baby Jesus was born. I Finished the binding for this quilt on a 6 hour road trip to go visit family for Thanksgiving last weekend. It took me 4 hours as I dont really like to sew by hand and I’m out of practice.. I learned that it would be helpful to pre-thread needles as it is quite difficult to do in a moving vehicle. It’s a good thing that my boys were able to do this for me as their eyes are much better than mine. The fat quarter bundle that I used consisted of red, green, beige ,and brown. Somewhere during the process of making this top I misplaced a few of the brown FQ so I opted to use more fabric for the browns to give a consistancy in colors. These are the colors that I worked with when designing the quilt. Next African Inspired Tumbling Blocks….